I was sleeping in the van I'd rented on Maui, parked at the 9,700-foot Visitor Center in Haleakala National Park. I'd bought a cheap $16 sleeping bag and a few $10 blankets at Walmart on my arrival and was putting them to full use this night. The 50 degree bag would have been woefully inadequate without the blankets as the outside temperature dropped to around 30F under a cloudless night with a howling wind that didn't let up all night. When I got up in the morning I cranked the van's heater while I dressed and ate breakfast before hitting the trail shortly before 8a, two hours earlier than I'd managed the previous day. I'd been on the island a week now and this was the first sunny day. Such can be the vagaries of winter in Hawaii. My plan today was to hike down into Haleakala's crater and tag as many of the named cinder cones as I could manage, minus those I had visited on two previous occasions. In all I would climb eight of them over the course of about 16mi with more than 4,600ft of gain. Afterwards, I had enough time to tag a few easy ones outside the crater, lower on the mountain's northwest side near the lower Visitor Center. 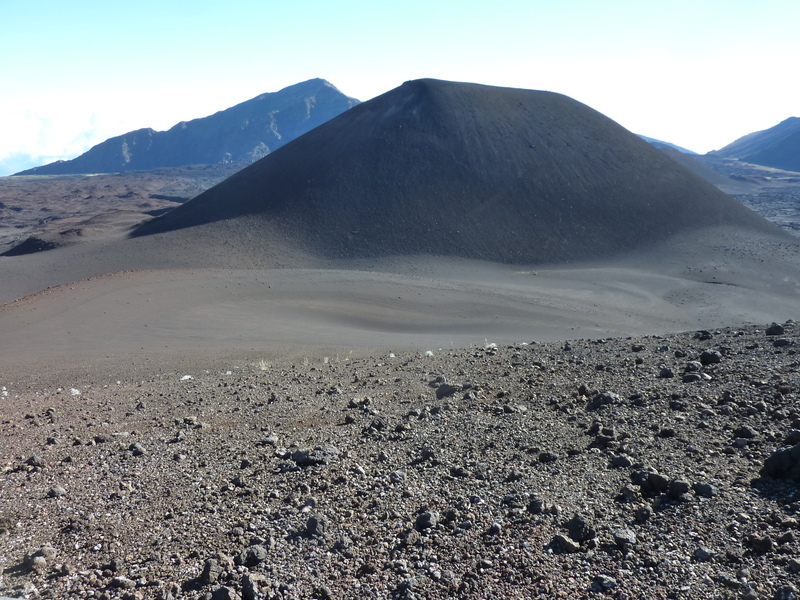 This is the highest cinder cone in the Haleakala's crater, only a few mile from the TH. There is a trail that forks off the Sliding Sands Trail to reach it, but it seems that since I first hiked it in 1991, the Park Service has removed the trail junction signs and closed the original route though it is obviously still used. Odd, because the trail still shows on the park brochure. The closure was probably because of a short but rough descent just past the junction that may have caused injuries to the unwary. My not-so-early start meant that there were a handful of other parties on the trail when I started down, but by the time I reached the unsigned junction (I had it marked on the GPSr) there were no others on the Sliding Sands Trail in front of me. I reached the summit with only about 30ft of prominence by 8:40a. There is a large pyramidal cairn here and unobstructed views today. 1/3mi to the east of Kal u'uoka'o'o is Kama'oli'i, a few hundred feet lower but a much tougher climb, rising 240ft from the saddle via which I climbed it on its west side. The footing is very poor and I struggled to make progress. If I went slow my feet would gradually slide backwards whereas a faster pace soon exhausted me. Ugh. Not all that bad though, as it only took 20min to reach the top from the first summit. This is the largest cinder cone and most difficult. The footing is as poor as Kama'oli'i with nearly twice the elevation gain. Though it was very early in the day still, I had to rest multiple times on the way up, finding my breathing unable to keep up with the oxygen needs of my legs. Ugh, Ugh. At least I'd gotten the two hardest ones out of the way early and could relax some. A long name for a little mound, found about 2.5mi east of Pu'uomaui. Between them are another half dozen other cinder cones that I had climbed previously and I was not unhappy to pass them by without going over their tops. I used a combination of a cross-country and trail to make my way at a leisurely pace, finding the wooden ruins of what looked like an old weather station and passing by Kawilinau, a 65-foot deep vent, fenced by the Park Service to keep the footing-challenged from falling in. Unlike the first three summits, this and the ones further east were much older and moderately vegetated with grass and brush. It was 10:30a when I made my way to the modest summit, noting that clouds were spilling into the crater from the east. 20min further northeast is Honakahua, another brushy summit of modest stature. I was happy to have use of the trail since it travels through an area of bad lava, the sort than looks like frozen sea foam, is horribly sharp and unstable. There are some ancient rock walls found here, similar to those found throughout the island. The tediousness of building one of these, stone by stone, was not lost on me. Paradise had its price back in the day. On the east side of the summit I found a rain catchment system, purpose unknown. Perhaps someone grazed cattle here at one time? This cone is most easily climbed from the west where the gradient is easier. Not knowing this, I climbed it from the SE, another tedious effort with poor footing and lots of downsliding. Ugh. It lies just north of the Kapalaoa cabin at the foot of Peak 8,432ft which I had climbed the previous day. Just to the left (1mi to the east) of Peak 8,432ft is the VABM summit of Haleakala which I had given up on the day before. I noted that the south side had mostly brush-free ridges that could be used to ascend from this side, but today would not be the day to give this steep 1,000-foot effort a go. I continued west cross-country for 3/4mi to the last stop of this tour, a modest cone that offered no trouble. It gave me an opportunity to do more interesting cross-country travel in the flats of the crater, coming across someone's rock art at what appears to be a random location away from the trail. I then returned to the Sliding Sands Trail and climbed it all the way back up to the top where I'd started. The clouds that had started to spill over the east wall was advancing behind me about as fast as I could hike, bringing a chill, fine mist and occasional rainbows. I had seen no one in the crater all day until I was a few miles from the TH. There were several parties of backpackers heading into the crater to spend the night, but unfortunately the views would be lacking for the rest of the day. Other day visitors were hiking down the trail, few of them properly clothed for the drop in temperature they would soon encounter, another of life's fine lessons. By the time I'd returned to the rim shortly before 3p, most of the crater was filled with clouds. I still had a few hours of daylight and ignoring my feet for the time being, headed down the hill for some easy bonuses. An exceedingly easy summit with a poorly paved road going most of the way to the top. This one is located at the northwest corner of the park on the outer slopes of Haleakala below the entrance station. There are some communication installations near the highpoint but one has to breach a cattle fence to get to the highest rounded point with modest brush at the edge of the forest line. A wall of clouds held off just to the north with some of them escaping across the landscape before evaporating when they met the drier air to the south. My day of sun was threatening to end on all sides.